FREETOWN, Sierra Leone (AP) — When the dreaded Ebola virus began infecting people in the Sierra Leone town of Kenema, Dr. Sheik Humarr Khan and his team were on the front lines. After stepping out of his protective suit following hours on a sweltering ward, he would jump on the phone to coordinate with the Ministry of Health, to deal with personnel issues and tend to hospital business. He was jovial but forceful. When he walked into a room everyone looked to him for direction and he gave it decisively, said Daniel Bausch, an American doctor who worked with Khan. But then Khan tested positive for Ebola at the end of July and died soon after. He is one of at least two leading doctors in Sierra Leone who have died in the outbreak, which has also hit Guinea, Liberia, Nigeria and Senegal. The World Health Organization says it has sickened a higher proportion of medical staff than any other on record, with 240 contracting Ebola and more than half of them dying. The toll on health workers was felt immediately by grieving and frightened colleagues and by patients who had fewer people to attend to them, and it will likely set back health care systems — poorly equipped amid rampant poverty to begin with — for years to come. Khan had been an expert in Lassa, which like Ebola is a hemorrhagic fever, meaning he brought tremendous expertise to the current outbreak. He was also key to improving Sierra Leone’s health system in general. The region’s weak health system infrastructure, along with poverty, helped fuel Ebola’s spread. 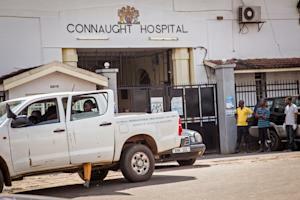 Modupeh Cole, a top physician at Connaught Hospital in Sierra Leone’s capital, Freetown, also died of Ebola. He was one of only three senior doctors who supervised junior doctors at the hospital, said Dr. Oliver Johnson, a British doctor who has worked there for two years as part of the King’s Partnership Sierra Leone. Cole’s death will hobble the hospital and might render it unable to offer post-graduate specialist training, Johnson said. The loss of senior doctors makes a huge impact because there are so few of them. Liberia has only one doctor for every 100,000 people, while Sierra Leone has two, according to World Health Organization statistics. In comparison, the U.S. has 245 doctors for every 100,000 people. 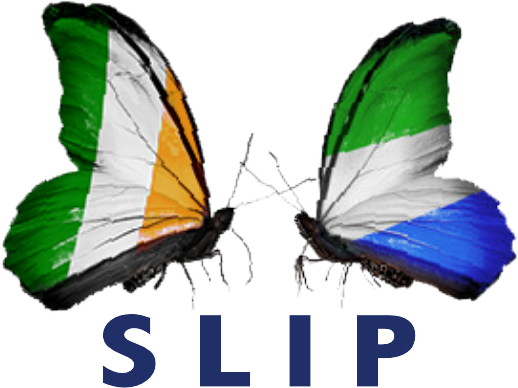 Guinea, Liberia and Sierra Leone are some of the world’s poorest countries and have histories of coups or civil war. Many of their brightest citizens, including medical professionals, had abandoned their countries and governments struggled to provide even the most basic services. Even before the outbreak, it was common for family members of patients in a Sierra Leonean hospital to be asked to supply basic equipment themselves, popping out to a pharmacy to buy gloves for the doctors, syringes and over-the-counter pain-killers. In Liberia, the government-run hospital in most counties is lucky to have one surgeon, on call 24 hours a day, seven days a week, according to Dr. Frank Glover, an American medical missionary who has worked extensively in Liberia and who founded SHIELD in Africa, which is dedicated to improving health care. Most county hospitals do not have ambulances, X-ray machines or a lab to do blood work, he said. Bausch recently found himself on an Ebola ward in Sierra Leone with only one other doctor and 55 patients because the nurses were all on strike. Bausch believes he was working with Khan around the time that the Sierra Leonean doctor became infected — and for Bausch there was no “aha moment.” The mistake can be so small, no one sees or remembers it. 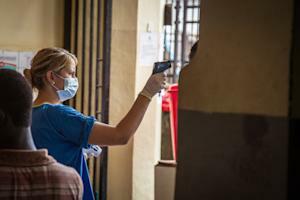 Bausch said the single most important thing the outbreak needs is more people — and not necessarily experts but people to clean wards and do laundry and help medical staff ensure they’re using their protective gear properly. That’s the best way to ensure patients are being taken care of and that health workers aren’t becoming so exhausted that they’re making the kinds of mistakes that can lead to infection. DiLorenzo reported from Dakar, Senegal.